Flowering Pineapple smells pretty was the first thought that went through my head when I first smelled it while at Teavana. I had yet another Starbucks/Teavana reward to use and I wanted to try one of their blooming teas. Flowering Pineapple has a beautiful delicate pineapple aroma to it, and it is quite the hefty tea. For the free reward, I get 1oz of any loose tea, and that 1oz equated to just four balls of the Flowering Pineapple tea. Considering how pricey it is per oz, it’s not very many balls. But it smells amazing and I really wanted to try it, so I got it! Flowering Pineapple is made up of: white tea, marigold blossoms, and artificial flavouring. 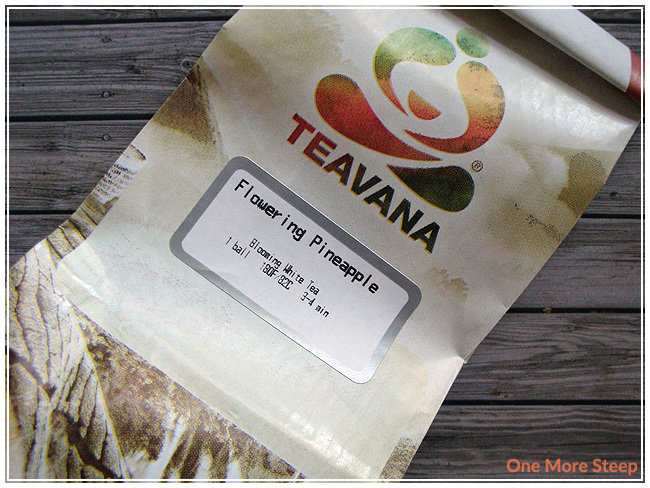 Teavana recommends steeping Flowering Pineapple in 82°C (180°F) water for 3-4 minutes. If you noticed on the label, it also recommends using 1 ball. I opted to steep it in a tea pot so I could see the blooming action a little bit better. Flowering Pineapple has a very light fruity smell to it when it is steeping. It does have the pineapple aroma, but it’s not as strong as it was when it was dry. The ball opens up quite a bit, as you can see in the photo. The tea leaves really add to the overall beauty in the way it circles the flower. 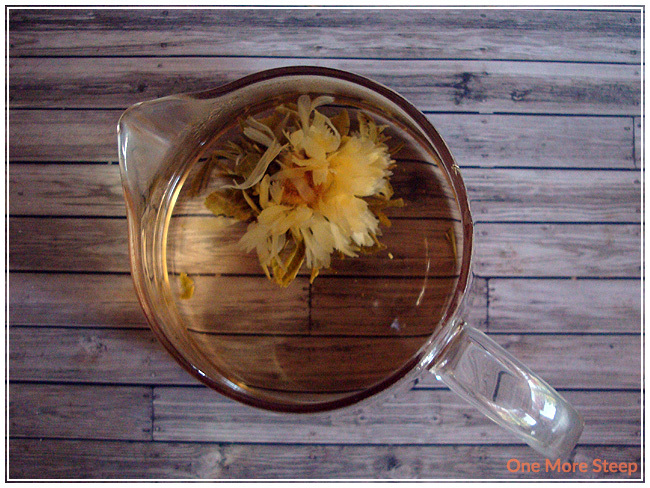 It is a very pretty blooming tea, and it is fun to watch the petals unfurl. The pineapple taste is very light, more of the natural white tea flavour comes through. Make sure you watch your water temperature and steeping time with this one. I prepared it according to the directions and had a lovely cup of tea with no bitterness or astringency. I find that the taste is very light though, compared to the white tea base. I wish more of the pineapple was present in the taste of the tea since it was there when the tea was dry. Many white teas can be resteeped, so I was hoping that Flowering Pineapple would not be an exception. It does fairly well with the second steeping. I can barely taste the pineapple, but the natural white tea taste comes through better. It does okay with the third steeping, but it’s not exceptional, and was beginning to have a very thinned out flavour. I liked Teavana’s Flowering Pineapple. While the pineapple taste was gone after the first time I steeped the tea, as I was expecting since it was an artificial flavouring, I like the white tea base. I do wish that there wasn’t the pineapple flavouring at all though, because the white tea base is quite nice and will hold up to a few steepings. It’s a fun tea to steep because it is a blooming tea and it is very pretty. But I do think that there are better white teas out there at a more affordable price. Assuming you could get 8 balls of Flowering Pineapple in 2oz, that works out to be ~$2.25 per ball/cup. That’s a fairly expensive tea when you think about it and the fact that there are better and less expensive white teas out there, even if you can resteep it again. If you are interested in trying it out, it might be a nice tea to use your free Starbucks/Teavana rewards on. 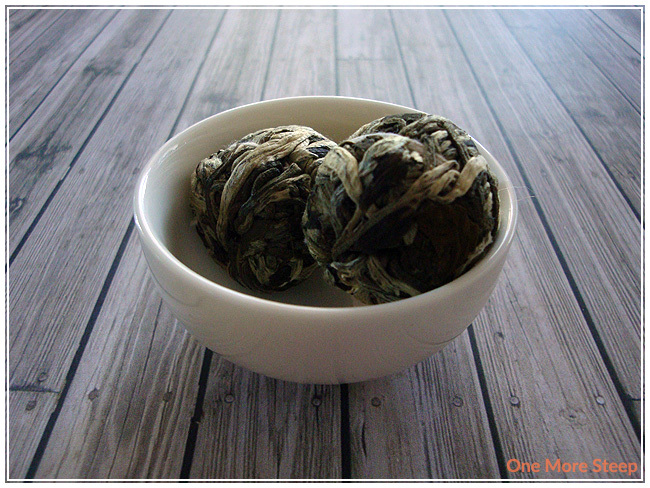 Unfortunately, I don’t know how much caffeine was in one ball – but white teas generally have lower caffeine content than black or oolong teas if that helps!